Gross Beat: not a graph plotting the fortunes of the global stock market. 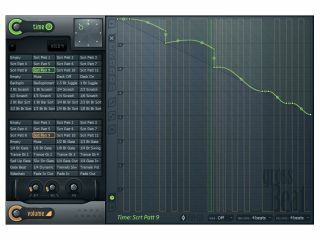 Registered users of Image-Line's FL Studio are being given a first taste of the company's new Gross Beat plug-in. This is a time manipulation processor that's designed for creating repetition and scratching effects, and it's currently in beta. Gross Beat can be applied in real-time - live performers take note - and features 36 user-definable time and volume envelopes. These can be MIDI controlled, while audio is stored in a 2-bar rolling buffer. Plenty of presets are supplied, though Image-Line says that you're given "unlimited creative control". The Gross Beat beta, which is FL Studio- and VST-compatible, will expire on 19 December. The full version will cost $99.